One of my family’s favorite places to grab a pizza pie is Dewey’s Pizza. In fact, you can find us either in the restaurant or carrying out several times a month. Sometimes I’ll grab lunch with a friend after preschool pickup, sometimes I’m grabbing a salad on the go, and sometimes it’s the whole fam out for dinner. With several Dewey’s locations in Northern Kentucky and Cincinnati, we have our pick of where to eat. The atmosphere at Dewey’s Pizza is always relaxed and casual which makes it the perfect place to take the family for dinner. Dewey’s Pizza is locally owned and over the years it has grown so that now there are over fifteen locations, and not just in our region, but also in St. Louis, Cleveland and Columbus! It doesn’t matter which Dewey’s you go to though, they all offer the same great pizzas and a nice selection of craft beers which includes their own special “Dewey’s Brew” crafted by local brewery Mt. Carmel. 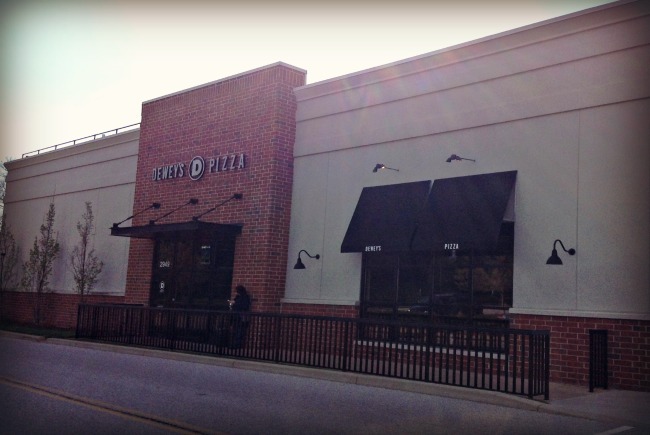 Dewey’s has many specialty pizzas to choose from, all with fun & interesting names. Our favorites include the Meatball (Red Sauce, Fresh Basil, Mozzarella Cheese, Italian Meatballs, Oregano, and Parmesan Cheese), The Bronx Bomber (Red Sauce, Mozzarella Cheese, Pepperoni, Sausage, Mushrooms, Onions, Green Peppers, Black Olives) and the Green Lantern (Red Sauce, Light Mozzarella Cheese, Minced Garlic, Mushrooms, Goat Cheese, Artichokes, Pesto). They also offer an option to build your own pizza, with your choice of sauces and toppings. They have the usual run of the mill toppings to choose from…sausage, pepperoni and the like. And they also have gourmet toppings you can select for your pizza such as Prosciutto, Amish Chicken, Artichokes and MORE. So if none of their specialty pizzas appeal to you then just build your own pizza creation! I love trying new pizzas and different topping combinations, but my kids (with the exception of Henry) are pretty picky when it comes to pizza. Lucky for us, at Dewey’s you can do a half and half pizza, so if I am ever there with just one child I can get half the pizza with a specialty pizza of my choice and half of it with just plain cheese and pepperoni for them. When we are all there together though we end up ordering a few pizzas and a salad. If Henry is with us you can be sure that one of the pizzas will be the Meatball Pizza. That kid LOVES this pizza and can put it away! The salads at Dewey’s are noteworthy as well. In fact, a large salad can either feed a family as a side or be a meal for one person. They are huge in size and huge in flavor. I’ve tried several of their salads and love each one that I’ve tried. They certainly have a way with creating flavorful salads that aren’t drowned in unhealthy toppings, instead they add fruit and nuts and cheese to their salads. Dewey’s has a seasonal menu that includes specialty pizzas and salad each season, and speaking from experience, I think their seasonal salads are always delicious. 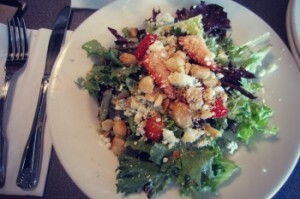 For summer they have a Strawberry Macadamia Nut Salad that is out of this world (see picture below). I could eat it everyday. When we go to Dewey’s we always order a salad to go with our pizza, because it is the perfect side dish for pizza. The salad prices are very reasonable, and you really do get large portions. Another menu item that I should mention is calzones. I’ve never tried one at Dewey’s but my friend has told me they are tasty too. You can create your own Calzone so it’s just the way you like it! There’s something to be said about the staff at Dewey’s Pizza too. It’s not like I have had just one or two great servers. I have experienced great service every single time I’ve gone. The staff as a whole is very attentive and efficient. I’ve noticed that usually we don’t have just one server, usually there are several people checking on us and taking care of us while we’re there. Drinks are quickly refilled, extra napkins appear just when you need them and the pizzas are always hot out of the oven when they hit your table. And I’ve never ever encountered a grouchy server at Dewey’s Pizza. The employees always seem happy and friendly and act as if they really do love their job. I think a friendly and nice server makes a world of difference when you are dining out. Even the chefs at Dewey’s are friendly and playful – the kitchens at Dewey’s all have a large window where the customers can watch the action in the kitchen. This is Henry’s favorite part of being at Dewey’s (well, this and the meatball pizza). He loves to stand at the window with his friends and watch over the kitchen staff. And the chefs are always having fun with the kids who are observing….whether it be by showing off while throwing the dough extra high in the air to make the perfect pizza or tossing a handful of flour at the little faces pressed against window, which always makes the kids shriek and giggle. Henry usually has to be dragged away from the window to eat his meal. All in all, Dewey’s is a great place to dine, one of our favorites in fact. To find out more about where to find a Dewey’s in your neck of the woods or to see what else is on their menu visit the Dewey’s Pizza Website.